Have you ever wanted to write a quick note for other writers on your WordPress site? In this article, we will show you how to add a notepad to your WordPress dashboard and share the note with other users on your site. Now remember, this can be done by using a third-party app like Slack, but we’re focusing on a WordPress based solution in this article. First thing you need to do is install and activate the Dashboard Notepad plugin. Upon activation, simply visit your WordPress dashboard. You will be able to see a notepad at the bottom of the screen. You can simply write down your notes and hit the Save notes button. Notice that it is just a single notepad window, so you will be adding new notes below the older notes. You may want to consider deleting old notes if it gets too lengthy to scroll. To configure the Notepad widget, you need to click on the configure link which will appear only when you take mouse to the tiny downward arrow at the right corner of widget. On the configuration screen, you can change which user roles can edit the notes, and which user roles can read them. All logged in users who has the permission to view the notes will see them on the admin dashboard. However, you can also display notes on the front-end of your WordPress site. Simply use the shortcode [dashboard_notes] inside a post, page, or a text widget. If the shortcode doesn’t work in a widget, then you need to enable shortcodes in text widget by adding this code to your theme’s functions.php file or a site-specific plugin. 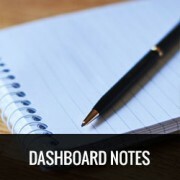 We hope this article helped you add a notepad to your WordPress dashboard. You may also want to check out how to customize WordPress admin area.